The new three-story, 47,000-square-foot facility, which will connect to the 29-year-old Ahmanson Science Building through a bridge walkway, will more than double the amount of space dedicated to science. 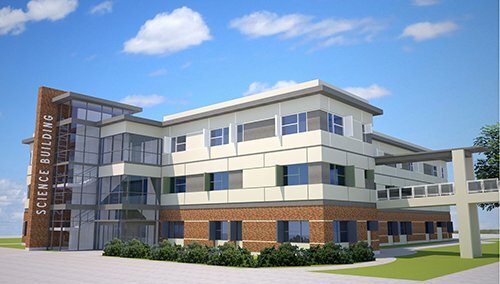 (THOUSAND OAKS, Calif. – Feb. 8, 2018) The public is invited to the groundbreaking for California Lutheran University’s $30 million science center at 11:30 a.m. Friday, Feb. 23. The event will be held at the building’s future location in the center of the academic corridor, just east of Pioneer Avenue between Memorial Parkway and Faculty Street on the Thousand Oaks campus. Brief presentations and a blessing will precede the groundbreaking. The last of the converted chicken coops that served as the university’s original buildings were demolished in January to make way for the new center. Construction is scheduled to be completed by fall 2020. The new three-story, 47,000-square-foot facility, which will connect to the 29-year-old Ahmanson Science Building through a bridge walkway, will more than double the amount of space dedicated to science. It will house the entire chemistry program and part of the biology and exercise science programs. The state-of-the-art building will feature 12 labs for teaching and eight designated for faculty and student research. Included among them will be labs used for biomechanics, organic synthesis, physiology and neuroscience, marine biology, cell and developmental genetics, exercise physiology ergometry, and nuclear magnetic resonance. The building will have several collaborative spaces and 24 faculty offices. The new center is needed to accommodate the growing number of science majors and the university’s increased emphasis on student research. The number of science majors at Cal Lutheran has more than doubled since 2005. About 30 percent of the student body is now majoring in science, technology or math. Cal Lutheran has increased research opportunities for students in recent years, putting a squeeze on lab space. Each summer, the university awards fellowships to dozens of undergraduates to conduct research full time with guidance from faculty members. The new facility will provide more dedicated space that can be used year-round for research projects. The center will also provide space for research and other programs funded by the $4.63 million Hispanic-Serving Institution grant Cal Lutheran received to support students in science, technology and math. This is Cal Lutheran’s largest fundraising campaign to date for a single building. Donor opportunities are still available. For more information on the event, contact Lana Clark at lclark@callutheran.edu or 805-493-3163. For more information on the campaign, email catalyst@callutheran.edu, call 805-493-3160 or visit science.callutheran.edu.